The Russian Church in Athens. Just about the middle of Philellinon street, stands the impressive church of Sotera (Savior) Lycodemos, which is also known as Agios Nikodimos or the Russian church. 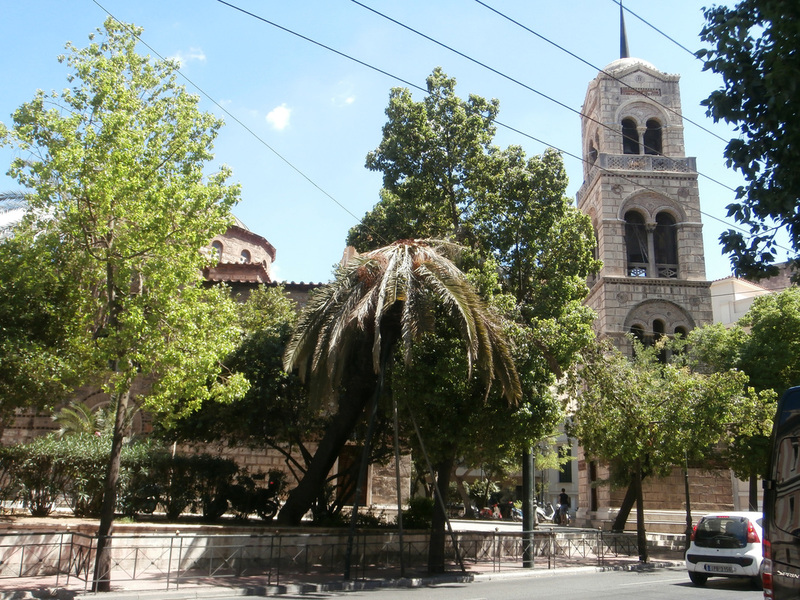 It is dedicated to Agia Triada (Holy Trinity) and is one of the most important Byzantine monuments in Athens and at the same time the center of the Russian community in the city. The church of Sotera Lykodimou, a large medieval structure built in 1031 over Roman baths, was constructed in order to serve as the catholicon of a Roman Catholic monastery. The church suffered serious damages at its western part from a cannon ball during the siege of the Acropolis by the Venetian general Morosini, in 1687. In 1705 it suffered new damages from an earthquake. 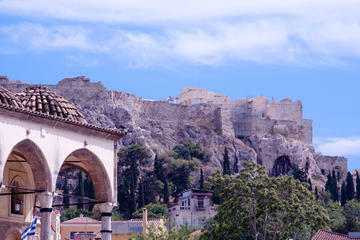 In 1778 the Turkish official Hatzi Ali Haseki demolished the surrounding wall of the monastery in order to use its material for the construction of the wall of Athens. ​We draw important information regarding its history from the 21 engravings on its walls, which were recorded and published by the archimandrite Antoninos in 1874. From these, two stand out, on the southwestern corner one refers to the death of the first founder of the church and provides the date 1031. In 1847 the church was purchased by the Russian government to serve the worship needs of the Russian community of Athens. Extensive repairs and restorations were done during Tsars Nicolas I and Alexander II between 1852-1856 and since then it has been serving as the Russian Orthodox Church of Athens. Architecturally the church belongs to the so-called “continental octagonal” type, in which the large dome of about 10 m. (33 ft.) in diameter, is supported by four pairs of pillars. On the east there is a tripartite bema and on the west a narthex. It is constructed according to the cloisonné system of masonry and in some spots it is decorated with dentil courses and pseudo-kufic patterns that mimic Arab letters. The tall bell tower on the northwestern corner, which resembles the Byzantine masonry of the church, was added by the Russians in the 19th century. The interior of the church was decorated with remarkable wall paintings, which were made by the Bavarian Ludwig Thiersch (1825-1909), professor at the Athens School of Fine Arts, who introduced Greece to the naturalistic Nazarene movement, which is quite different from the principles of the Byzantine tradition. The built screen of the church is heavy and tall, and was also constructed by the Russians as well, on the location of the older Byzantine one. Its modern steeple possesses the largest bells in Athens.